When it comes to RV’s and campers, there are two main types; motorized and towable. 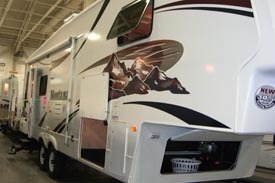 Class A, Class B, and Class C motor homes are all motorized. Fifth Wheel campers are one of the types of towable campers, and one of the most popular. But what is a 5th wheel camper? The distinguishing feature of a 5th wheel camper, and the thing that makes it a 5th wheel camper, is its hitch and how it hooks up to its towing vehicle. 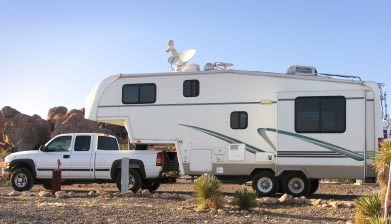 A 5th wheel camping has a gooseneck hitch that hooks into the truck bed of a heavy duty truck (the towing vehicle). By hooking the camper into the bed of the truck, there is better stability and a better center of gravity. Many travel trailer owners complain of the swaying back and forth that their trailers do when they are towing them. Fifth wheel owners don’t have this problem. Many say they hardly realize they are towing a camper because the 5th wheel is so easy to tow. That stability and better center of gravity comes at a price though. The gooseneck hitch requires a truck for towing, and the heavier weight of a 5th wheel requires a heavier duty truck to do that towing. And, when you look at towing capacities, try to stay under the recommended maximums for your vehicle. Many people recommend this. It’s much easier on your truck’s transmission. Either opt for a lighter 5th wheel than you originally planned or invest in a heavier duty towing vehicle. Fifth wheel travel trailers are available in many different lengths starting at 22 feet and up to 40 feet. The most popular sizes are the 32, 34, and 36 foot 5th wheels. To gain additional interior space, most 5th wheels have optional floor plans that include slideouts. Slideouts are most often used in the living room and dining room area, but they are often utilized in the master bedroom area as well. Multiple slideouts are becoming more common and more popular. I’ve seen as many as five slideouts on one fifth wheel. Keep in mind though, that slideouts add weight to a fifth wheel. The cost of a new 5th wheel varies widely depending on the length you choose; the number of slideouts, if any; and the extra amenities you purchase. Prices start at $26,000 - $30,000 (not including the cost of the vehicle to tow it); and can get close to $100,000 for high end models with all the optional amenities. How Many People Can I Get In It? The number of people a 5th wheel will sleep comfortably will vary depending on the size and the floor plan you choose. Most floor plans have only one bedroom in them, the master bedroom. The additional sleeping areas are housed in the sofas and in the dinette areas, depending on the model of 5th wheel. Typically, a 5th wheel will sleep 4-8 people comfortably although the open floor space does give you enough room to inflate an air mattress and offer sleeping space to a few more people if you are really short on sleeping space. Easy Towing because of the gooseneck hitch. Spacious and roomy inside. A 5th wheel has lots of room inside. If the weather outside is inclement, there is plenty of room for everyone to be inside enjoying the amenities. 5th wheel can be detached at destination which frees up the towing vehicle for excursions and trips around the area. A towing vehicle, outfitted with a special package to house the gooseneck hitch is needed. Because most 5th wheels are heavy, the towing vehicle needs to be heavy duty. But, on the bright side, manufacturers have begun to introduce lightweight 5th wheels that can be pulled by smaller trucks. The steps. Some people don’t like the bi-level design of a 5th wheel travel trailer and don’t like having interior steps that lead to either the master bedroom that is typically housed in the area of the trailer that sits over the bed of the towing vehicle (although this area is also sometimes the living room area). If interior steps are a problem, you may want to consider a travel trailer or consider a motorized RV. The cost. Fifth wheel campers are the most expensive of the towable RV’s which can make them too expensive for entry level buyers. If you really have your heart set on a 5th wheel, consider purchasing a used 5th wheel. There are some very good deals available on “previously road tested” 5th wheels. Fifth wheel campers are my personal favorite type of towable camper because of the ease of towing and the incredible interiors. If you haven’t looked inside a 5th wheel, go to your local 5th wheel dealer and ask to look at one. You’ll be amazed at how nice and how spacious they are on the inside. One popular floor plan, my sister-in-law’s favorite, has a master bedroom at one end of the camper and a room with three bunk beds at the other which is perfect for her three kids. My personal favorite floor plan has the master bedroom at one end with a king size bed in it (and an optional washer dryer) and a living room area at the other end with a large bay window and two leather recliners. I could see myself stretching out in one of those recliners with a cold beverage at the end of a long day hiking or biking the trails at one of my favorite campgrounds. Another thing I love about 5th wheel campers is their awesome kitchens. They are surprisingly room, with ample cabinet space, the availability of solid surface countertops, the availability of stainless steel appliances in some models, slide out pantries, microwave, kitchen islands (again, depending on the model and manufacturer), and snack bar area. Remember, when looking for a fifth wheel, first and foremost on your mind should be the towing capacity of your vehicle unless you are buying a different towing vehicle. Once the towing concerns are out of the way, you can concentrate on the style, color, and amenities you want most in your new home away from home.